How many non resident women gave birth in hospitals run by the Canterbury DHB in the past five years? Were non residents billed by the DHB for the births, if so how many? Of those billed, how many paid the bill and what was the total each year? What was the cost of the most inexpensive and expensive non resident births for the DHB in the past five years, and were those bills paid? Did the DHB sue any of the non residents for non payment? What was the legal cost to the DHB of pursuing those birth costs? Has the DHB experienced birth tourists as other countries do? Has the DHB ever turned away any expectant mothers because they were non residents? Have any non residents used fake passports or identification? 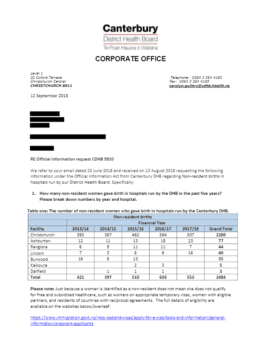 Does the DHB run any fraud type campaign/hotlines to try to stamp out non residency birth non payments/frauds?